The medical term pediculosis is used in both English and Spanish to refer not to a particular type of infection but, rather, to an ‘infestation with lice’ in the body of a person, typically in the head. The word lice [ˈlaɪ̯s] is the plural of louse [ˈlaʊ̯s], and it is much more common than the singular in English. It refers to ‘any of numerous small, flat-bodied, wingless biting or sucking insects of the orders Mallophaga or Anoplura, many of which are external parasites on various animals, including humans’ (AHD). 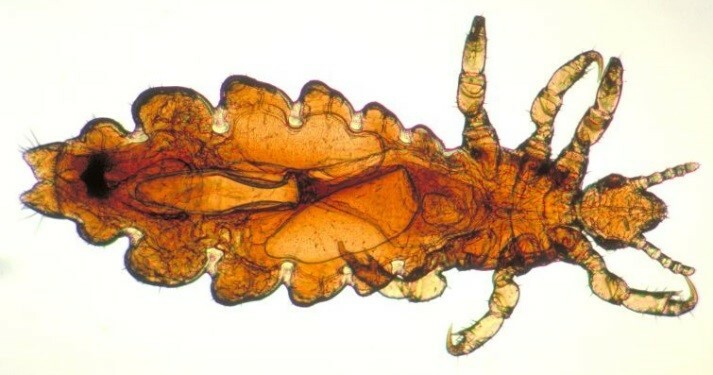 Lice are blood-feeding ectoparasitic insects of the order Phthiraptera. The term pediculosis typically refers to Pediculosis capitis ‘pediculosis of the head’, which is the infestation of the head with a specific species of head louse, Pediculus humanus capitis ‘head louse’ (Sp. ‘piojo de la cabeza’ or ‘piojo del cuero cabelludo humano’). In addition, there are two other possible types of infestations, namely on the body, known as Pediculosis corporis ‘pediculosis of the body’, produced by Pediculus humanus or Pediculus humanus corporis, and of the pubic area, known as Pediculosis pubis or Phthiriasis pubis, infected by Pthirus pubis ‘crab louse’ (mistaken but accepted form of Phthirus). This last type of lice is popularly known in English as crabs or pubic lice and in Spanish as ladillas. (Sp. ladilla is obviously a diminutive derived from lado, from the Latin adjective lātus meaning ‘wide, broad’ as well as ‘spacious, extensive’. Spanish lado was also an adjective meaning ‘broad’, but also ‘flat’, until at least the 13th century. The reason for the name for the insect is supposedly its flat and broad shape. The word for louse in Spanish is piojo, a patrimonial word that is related to the technical term for this condition. The English adjective lousy [ˈlaʊ̯.zɪ] is derived from the singular louse and originally, it also meant ‘infected with lice’, equivalent to Sp. piojoso/a. Today, Eng. lousy is not used with that literal meaning, however, since the word has acquired other figurative meanings. Its new senses can be paraphrased as ‘extremely contemptible; nasty’, as in a lousy trick, ‘very painful or unpleasant’, as in a lousy headache, or ‘inferior or worthless’, as in a lousy play (AHD). The term pediculosis was created in the early 19th century in the medical world out of pediculus, diminutive of pēdis ‘a louse’ and the medical New Latin suffix ‑osis. We have already come across the suffix ‑osis, which comes ultimately from Ancient Greek ‑ωσις (-ōsis) ‘state, action’, but in medical terminology ‘abnormal condition’. This Greek ending is found in ‑όω (-óō) stem verbs to which the noun suffix ‑σις (-sis) was, which is equivalent to the Latin noun ending ‑ĭōn‑. Lat. pēdis (genitive: pēdis, accusative pēdem) was the word for ‘louse’ in Latin. However Lat. pēdis was also the genitive of the word pēs ‘foot’. Perhaps because of this confusing similarity and because of the small size of the bug, the typical term for ‘louse’ in Latin was the diminutive pĕdīcŭlus or pĕdĭcŭlus (it is not clear whether the i was short or long), which can also be the diminutive of pēs and thus be translated as ‘little foot’, as well as ‘footstalk’. Others have suggested there is a connection between the root ped‑ in the bug’s name to the verb pēdĕre ‘to break wind, fart’ (ultimately from Proto-Indo-European root *pesd- ‘to fart’), presumably because of the unpleasant smell associated with infections (cf. Sp. pedo ‘fart’ and dialectal peer(se) ‘to fart’). Spanish piojo ‘louse’ is a patrimonial descendant of Vulgar Latin peduclus, a variant of peduculus, a descendant of the diminutive pēdicŭlus, a word that we discussed in Chapter 16, §16.7. English has also borrowed the word pedicle from Lat. pĕdicŭlus. It is used in biology (anatomy and zoology) to refer to ‘a small stalk-like connecting structure’ or the ‘footstalk of a plant’, and in medicine, to ‘part of a skin graft left temporarily attached to its original site’ (COED). The Spanish also has learned versions of this word to express these two meanings, namely pedúnculo for the former and pedículo for the latter. The modern Spanish noun lado ‘side’ comes from a different word, namely from Lat. latus, gen. lateris, ‘side, flank’. Yet a third Lat. lātus was the passive participle of the verb ferre ‘to carry’ (ferō, ferre, tulī/tetulī, lātum).